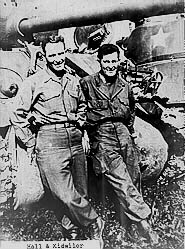 and joined the 7th Armored Division. Fought from Omaha Beach across France, Belgium, Luxenburg and Holland. Lost our tank in Holland, but we knocked out a Tiger tank before losing ours. Fought in Battle of the Bulge at St. Vith. Crossed Rhine river and headed for Baltic Sea, when war ended. Won 4 battle stars. Saved the life of one of his tank crew members but was never recognized for his heroic deed. Came home October 1945 and was discharged in December 1945 . As originally published on Saturday, August 21, 2004. Mr. George "Bill" William Kidwiler, 79, of Knoxville, Md., died Thursday, Aug. 19, 2004, at his home. He was the husband of Beulah Heath Kidwiler. They were married for 57 years. Born on Nov. 16, 1924 in Brunswick, Md., he was the son of the late George T. Kidwiler and the late Hazel Cooper Kidwiler. He was a member of Bethany Lutheran Church in Brunswick, Md. He was a dispatcher on the B&O railroad for 43 years where he was a member of the B&O Veterans Employee Association. 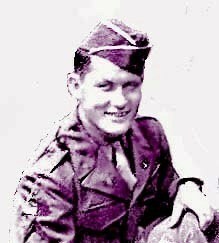 He served in the U.S. Army during World War II and was a veteran of the Battle of the Bulge. He also served in the Brunswick American Legions Color Guard and was a member of the 7th Armed Division Association. He was an avid Pro duckpin bowler and enjoyed playing cards at the VFW. He was a member of the VFW Post #10421 and the American Legion Post #96 both in Brunswick. In addition to his wife, he is survived by one daughter, Linda L. Henson and husband Donald of Knoxville, Md. ; two grandchildren, Paula Seiple and Rhonda Pyles and husband Shane; and six great grandchildren, Anthony and Hunter Seiple, Khristena Daugherty, Shawn, Joshua and Jonathon Pyles. He will also be remembered by a special niece, Karen Cornelius and husband Norman. He was preceded in death by a brother, Harry T. Kidwiler; a daughter, Dorothy Kidwiler; and infant twins. Friends may call the Stauffer Funeral Home, 1100 North Maple Ave., Brunswick on Saturday, Aug. 21, 2004 from 2 to 9 p.m. where the family will receive friends from 2 to 4 and 7 to 9 p.m. Funeral services will be on Sunday, Aug. 22, 2004 at 1:30 p.m. at Bethany Lutheran Church, 111 First Ave., Brunswick, Md., with Pastor Andrea Earnest officiating. Burial will be in St. Mary's Cemetery, Petersville, Md. Pall bearers will be Dr. Benjamin Weiser, Danny Weiser, Sam Folland, Dwight Crone and Steve Cascio. Honorary Pall Bearers will be members of the VFW.